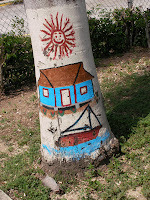 A really interesting idea I spotted recently, - primary school students painting their version of Caymanian traditional scenes on the bottoms of trees around the school campus. This really demonstrates their involvement and ownership of their school environment, whilst reinforcing cultural images in this fast changing island. More interestingly though is the real importance and focus to ensure that the new schools we are building here have Caymanian culture infused throughout the design process. A key aspect in the new school designs was the appointment of a Cultural Advisory Group which was involved in every aspect of the school design process and architects who listsened. The completed designs reflect so many elements of Cayman as core design features. It is so important to ensure that which is unique to a culture is preserved and promoted where ever possible in schools Too many schools are anonymous buildings with just a few framed photographs as the only reminder of the area or culture they serve. Students - "done to or done with?"